Celebrate the 4th of July in a big way – the Cowboy Way! 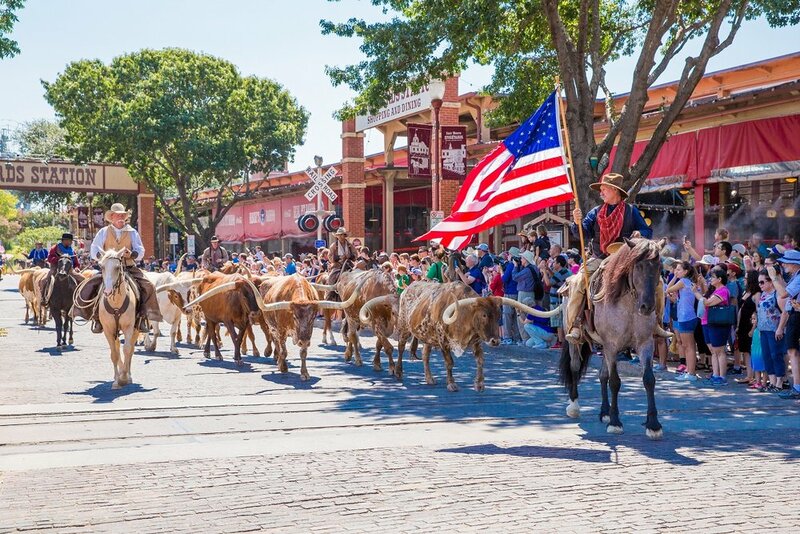 Spend your holiday weekend with us in the Historic Fort Worth Stockyards for a Red, White and Boots celebration, perfect for the whole family. Activities throughout the day will include Live Music, Longhorn Cattle Drives, Legends of Texas Gunfights, Face Painting, Food Trucks, a Beer Garden, and Farmers Market. Grab a quick bite at Riscky’ s BBQ or Trail Boss Burgers and check out all of the uniquely western shops Stockyards Station has to explore. Hop on a historical walking tour, go horseback riding along the Trinity River with Stockyards Stables, or take a train ride along the Trinity River on the Grapevine Vintage Railroad to round out your fourth! 11:30 AM & 4 PM: Free Longhorn Cattle Drive on E. Exchange Ave. If you are interested in setting up as an Exhibitor or a Food Truck at Red, White & Boots, please complete the form attached here or contact Holly Conner at hconner@stockyardsheritage.com or 817.710.7371 for more details.